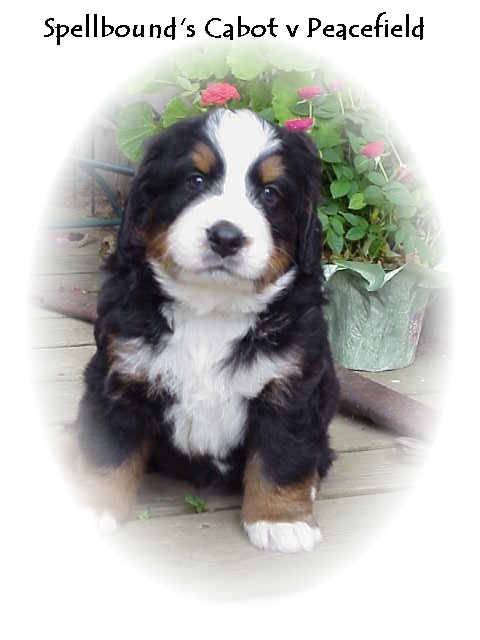 It was way back in the winter of 1998 when we first saw Bernese puppies in the flesh? ?is it fur? They were the cutest little bundles I had ever laid eyes on. It was a feeling I cannot put into words really, but you all know what I mean. We chose the dam we liked, and gave our breeder, Sherri, thanks for letting us into her world, and her home, filled with Berners that completely welcomed us into their whelping boxes to see their babes. They demonstrated the perfect lean and showed us what that famous Berner Bump exactly was. Then we waited, for those pups were already spoken for. Time went by, and we were happy to meet the breeder and her dogs at a few shows. We traveled to a Specialty or two together, and she even let me show her dogs a few times! Boy, it was nice to be in the ring with a beautiful Bernese at the other end of the lead! I felt like that?here I belonged. Soon we heard that the dam was in heat and was to be bred. We were anxious, and counted the days to puppy?omecoming! We shopped for puppy stuff (which Chelsea, our lab, was happy to break in!). We waited for the birth announcement, and called often to check in. Two weeks or so before the due date, we heard that there were no puppies in the oven. And so, we waited...again. After what seemed like forever, the dam is bred again and is definitely in whelp! We shopped for puppy items again, since by now, the toys we bought before are very well used. (Thanks Chels! J ) On June 14th, the pups were born, and we were thrilled to hear that there? special boy in there for us. Sherri tells us that he is just perfect. I always joked that I?e there at 2, 4, 6 & 8 weeks, but we missed the 2 week visit. We wanted to visit but with summer?ectic schedule, we weren?ble to get there until they were 4 weeks old. On July 16th, we make the drive north into the heart of Maine, pull in the driveway and say our hello?Sherri taunts me and brings out all the big dogs to visit first. I am just dying to see the pups, but hesitate to hurry? ?have all afternoon for crying out loud! The dam, Seairha, brings her cow to visit us, a toy that she just adores when she doesn?ave the puppies with her. We finally enter the puppies?om, and I instantly fell in love! There he is, looking at me! Sherri picks him up and places him in my arms? ?nhale all the puppiness I can breathe in. He looks at me and licks my chin. I can?tand it! Tears well up, for he is mine. I bring him to my husband, and we hold him together for a moment. He is mine and I already love him!